On September 4, 1945, aboard the USS Levy, Rear Adm. Shigematsu Sakaibara surrendered Wake Island to Brig. Gen. L. H. M. Sanderson, USMC. Shortly after the surrender a landing party of marines took a small whaleboat to shore. 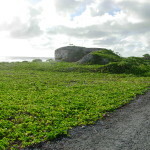 Colonel Walter L. J. Bayler, the last American to leave the island freely in December 1941, was the first American to set foot on Wake in 1945. The sights that greeted the landing party and those who followed were astonishing. Photographers and correspondents, including Sgt. Ernie Harwell, accompanied the American military contingent and recorded the proceedings. In a magazine article published soon afterwards, Harwell described the entire span of World War II as lying between two flagpoles they found standing on Wake: the old, bent and rusted shaft from which the American flag was torn down by the invading Japanese on December 23, 1941, and the new pole erected that day to fly the American colors after the Japanese surrendered the atoll. 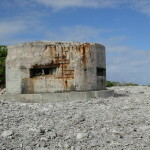 After Japanese forces captured Wake on December 23, 1941, they occupied the atoll for the duration of World War II. 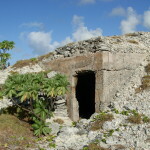 Initially the Japanese utilized much of the infrastructure built by the American civilian contractors in the months before war, adapting structures and building more for their own garrison and defenses. American prisoners provided much of the labor in the first months of war until the last 98 Americans were killed in 1943. 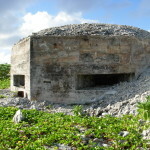 American forces did not try to retake Wake Island but bombed it relentlessly during the last two years of war, destroying most of the above-ground structures. Essentially blockaded and cut off from its lines of supply, the Japanese garrison suffered and starved. As many as fifteen hundred died of malnutrition or diseases, six to eight hundred were killed by air attacks, and a thousand near death had been evacuated by hospital ship just two months earlier. 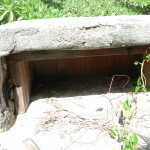 The remaining emaciated troops had been living underground and posed no threat of sabotage to the Americans after surrender. And there were the three graves, mounded and topped with big crosses, the paint not yet dry on the markers and posts that surrounded the area. In the coming weeks and months arms and munitions – including Springfield rifles seized from the Wake defenders back in 1941 – were loaded on the docks and shipped out, as were other intact supplies. Mountains of scrap metal were piled up to be barged out. The face of Wake changed again and again over the coming years as users and custodians reshaped it for their purposes. 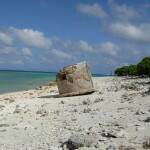 Over time the old hull of the Suwa Maru, one of the last Japanese supply ships to reach Wake only to be torpedoed and run aground on the south reef, has gradually disappeared into the sea. 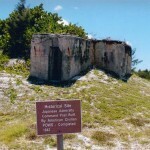 Sturdy structures like the admiral’s command post by the bridge to Peale stand half-buried and crumbling under the relentless pressures of weather and time. The surging sea washes into the old shoreline defenses, filling them with sand and debris. Vines and brush swallow old foundations and roadways. The wind scours everything in its path every day. Major typhoons sweep over Wake every decade or two, wreaking havoc on everything, irrespective of origin, age, viability, or value. 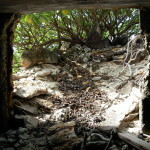 Still the ruins of war remain on Wake, warning us to never forget. 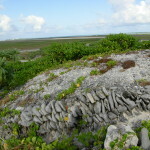 In October 1985 Wake atoll was designated a National Historic Landmark and subsequent surveys and preservation efforts have helped to arrest some of the decay and destruction. During my visit to Wake in 2011, I visited every historic structure and ruin I could find and some that I would never have found without the help of Wake residents who know where to look. 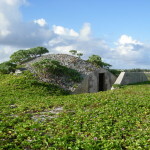 The rounded, reinforced concrete magazine-bunkers on Wake and the concrete seaplane ramp and parking area on Peale are all that remain of the American prewar construction. 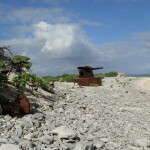 One doesn’t have to go far anywhere on the atoll to find remnants of Japanese defenses including concrete pillboxes, revetments, underground bunkers, all manner of stone defense works and walls, and the rusting hulk of the 8” gun on the seashore of Peale. The two flagpoles that served as Sgt. Harwell’s war metaphor are, of course, long gone. Concrete and stone have proved the sturdiest materials to survive over the decades. In the end, however, time and tide will wait for no man. Sources include Building for War and Sgt. Ernie Harwell, “The Wake Story,” Leatherneck, November 1945. Thanks to Paul Mitzelfelt for two of the photographs in the gallery. 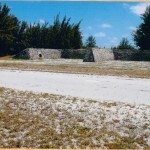 Bonnie: Thanks again for your updated information regarding Wake Island. Ernie became an outstanding Detroit Tigers Baseball announcer and I think Hall of Fame. I appreciate your information and am currently reading “Victory in Defeat” by Urwin. What a great experience to visit Wake as you did in 2011. At the age of 6, I can remember my great Uncle leaving for Wake Island and returning after the war. He used his carpenter skills to survive, but could not hold a full time job. He re built my parents kitchen and to this day it looks very nice.